During World War II, some companies moved out of the cities and into smaller towns to try to avoid the effects of bombing. 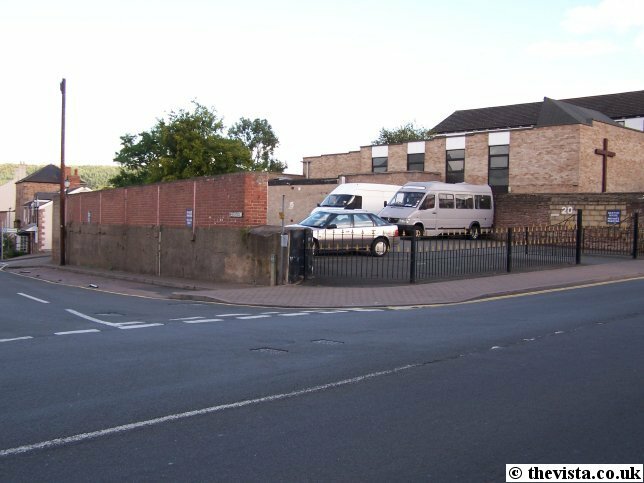 During this period, Multicore Solders Ltd moved into Ross-on-Wye. 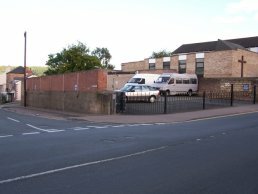 Their factory was on the site of what is now the Merton House car park and was, at that time, the Central Garage. Laddie Bennett built the garage in 1937 and no sooner than the business got underway then war broke out. Multicore Solders were involved in essential and secret war work as they produced a special kind of high grade industrial solder. They were looking for premises in Ross and were delighted to discover that the garage was the only place in Ross equipped with the industrial grade electricity supply they needed. They requisitioned the showroom, blacked out the floor to ceiling display windows and moved in. Although the rest of the garage was not affected, Laddie had to move out completely because Multicore Solders were involved in work classified as secret so he became a wartime reserve policeman for the duration. After the war, the work of Multicore Solders was de-classified and so Laddie was able to re-start his garage business, although he continued to allow Multicore Solders to occupy the showroom and they paid him rent for several years after the war. 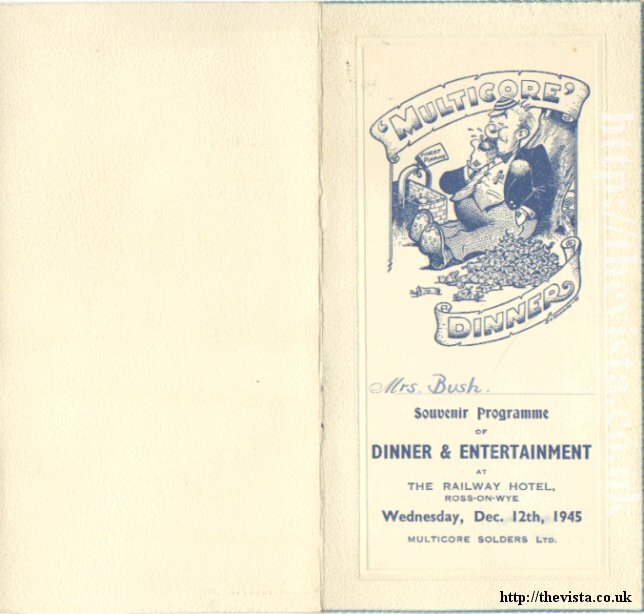 During this time, Multicore Solders, which is now part of the Loctite Group, took great care of it's employees as can be seen by the effort that was taken to produce the company's "Multicore" Dinner Souvenir Programme for the Christmas company dinner and entertainment held at the Railway Hotel, Ross-on-Wye on Wednesday 12th December 1945. This particular invitation was for Mrs Bush. 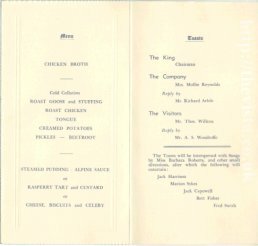 The dinner consisted of three courses interspersed with toasts and Songs by Miss Barbera Roberts, and was followed by entertainment from Jack Harrison, Marion Sykes, Jack Capewell, Bert Fisher and Fred Smith although I have so far been unable to find further details about any of these people or the event. 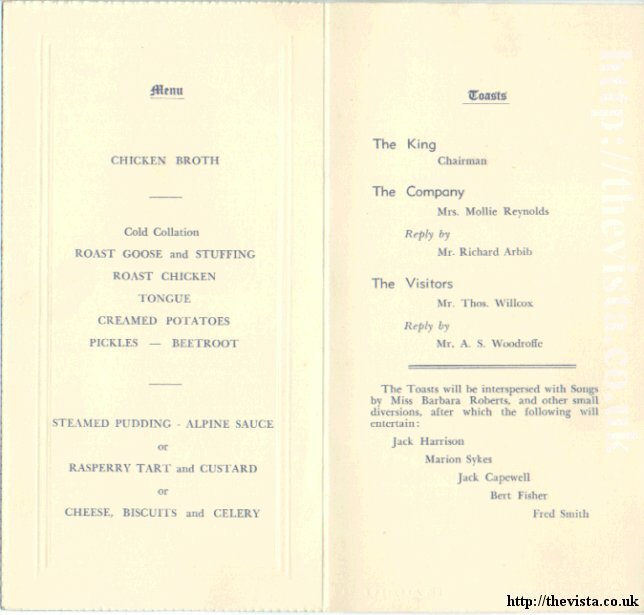 Jack Harrison and his wife Mary Harrison were the owners of the Railway Hotel at Fiveways. 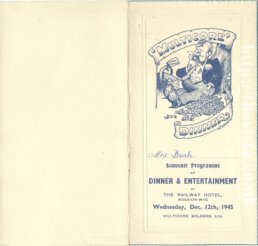 Jack did Magic shows on the side, so he would have done this at this dinner1. 1 Thanks to Mr. Devlin for adding these details.